Swaraj’s visit to Mongolia is the first by an Indian foreign minister in 42 years. Prime Minister Narendra Modi had visited Mongolia in May 2015. External Affairs Minister Sushma Swaraj reached Mongolia for a two-day visit to the landlocked nation north of China on Tuesday. The EAM took a special flight for Ulaanbaatar from Beijing after wrapping up her four-day visit to China. She was received at the airport by Deputy Foreign Minister of Mongolia B Battsetseg. “First visit of an Indian External Affairs Minister to Mongolia in 42 years! 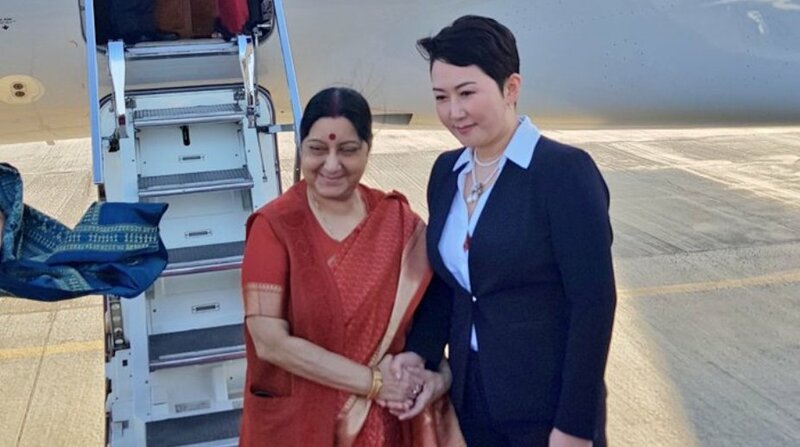 Reconnecting with our shared Buddhist heritage, EAM @SushmaSwaraj warmly received by Deputy Foreign Minister of Mongolia, B.Battsetseg on her arrival in sunny Ulaanbaatar,” wrote MEA spokesperson Raveesh Kumar on Twitter. In Mongolia, the EAM will co-chair the 6th round of India-Mongolia Joint Consultative Committee (IMJCC) meeting with her Mongolian counterpart Tsogtbaatar. She will also address a gathering commemorating the birth anniversary of Late Venerable Kushok Bakula Rinpoche, a revered Buddhist leader and monk from Ladakh who was also the longest serving Ambassador of India to Mongolia, in Ulaanbaatar. Before her departure from China, Swaraj had strongly criticised state-sponsored terrorism without naming Pakistan at the Shanghai Cooperation Organisation (SCO) foreign ministers’ meeting. In the presence of Pakistani Foreign Minister Khawaja Muhammad Asif, Swaraj urged the SCO to fight against terrorism and identify states that “encourage, support and finance” the menace and “provide sanctuary” to terror groups. “Terrorism is an enemy of the basic human rights: of life, peace and prosperity,” Swaraj said. On Monday, Swaraj had called on Chinese President Xi Jinping in Beijing for a formal one-to-one meeting. It was their first since Xi was elevated to the status of ‘president for life’. The two leaders were seen warmly shaking hands and having a brief chat before posing for photographers ahead of their meeting. “China regards boosting the development of the Shanghai Cooperation Organisation as one of its diplomatic priorities,” Xi had said during his meeting with foreign ministers of SCO of which India is a member state. 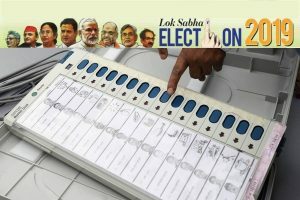 One of the major achievements of Swaraj’s visit was the confirmation of an “informal summit” between Indian Prime Minister Narendra Modi and Xi Jinping. Following a meeting on Sunday with Chinese Foreign Minister Wang Yi, the two sides announced that PM Modi will be visiting China on 27 April for a two-day summit with Xi in Wuhan. “The informal Summit will be an important occasion for them to exchange views on bilateral and international matters from an over-arching and long-term perspective with the objective of enhancing mutual communication at the level of leaders,” Swaraj had said in a press briefing after the meeting. In his address, Wang Yi said that the meeting between Xi and Modi will be “a complete success and a milestone” in the relationship between the two countries. The focus of the meeting, the two ministers said, will be on terrorism, climate change, sustainable development, global healthcare, etc. During her China trip, Swaraj also met her Kyrgyz and Uzbek counterparts and discussed cooperation in a number of key areas including trade and investments. She also held a special session with Chinese students of Hindi language calling for the need for the people of the two nations to learn each other’s language to overcome the communication barriers and strengthen the relationship between India and China.